Virginia law will allow for divorce by affidavit beginning July, 1 2012. This will end the requirement of oral testimony at court or deposition by one divorcing spouse and a corroborating witness. This was required, and affidavits will continue to be required, even when all custody, support and property issues are settled. The new law will dispense with the need for these uncontested divorce hearings, which the divorce apparatus of clerks, judges and lawyers insist on calling ore tenus hearings. This will also end my practice of filing all uncontested divorce cases in the Circuit Court of Arlington County. I did this because the Court was convenient to most clients, witnesses and me and scheduling was easy – Tuesdays and Wednesdays at 9:30 a.m. Also because from the point of view of our clients it was a clear event ending the case. You went to court, you told your story, the judge listened and signed an Order granting your divorce, and you walked out of the courthouse with a certified copy of your Final Order of Divorce, all within an hour. I’ve always thought that after all most people go through at the end of a marriage, and the all the twists and turns of the legal and financial separation and divorce, it was fitting to conclude with a clear event like the uncontested divorce hearing at which the Judge signed the Final Order of Divorce. 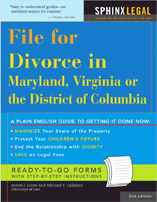 Alas, from now on Virginia clients, like those in Maryland and DC, will receive their Final Order of Divorce in the mail a few weeks or months after signing off on the now-forgotten affidavit – another piece of mail from the divorce lawyer.